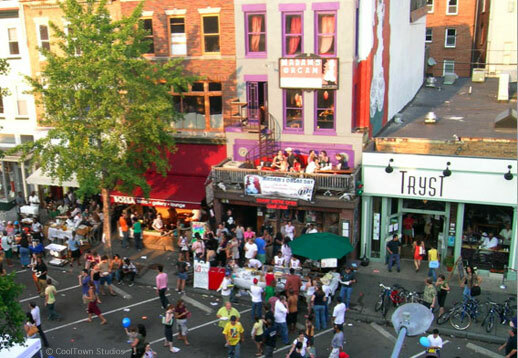 Adams Morgan, the preeminent natural cultural district of Washington DC, has no problem attracting nightlife whatsoever, especially on the weekends when you’ll have difficulty walking down the sidewalks that are packed with pedestrians. However, weekdays during the day are another story, when only a tiny fraction of the restaurants are even open and pedestrians are sparse. The picture above isn’t a normal day (taken during the annual Adams Morgan Day festival), though that’s what it could be if the region’s share of the 30 million people working at home decided to crowdsource a hundred closed-during-the-day businesses into a contemporary information economy workplace district. That’s what the newly established Adams Morgan Works crowdsourcing program is for, to follow the lead set by the highly successful Tryst coffeehouse, The (24-hour) Diner and coworking Affinity Lab and establish the customer base for the openings of several more daytime workplace venues. Initiated by CoolTown Beta Communities, Think Local First and Salon Contra, if you live in the area, become one of the founding members by joining its crowdsourcing groupsite here. You can get the vibe for the nascent entrepreneurial business community in this video. The first project at hand is helping a modern Euro-style restaurant transition to being open during the work day – can it be done? Will they provide a more affordable daytime menu? You’ll determine its success as you score points for your contributions and earn rewards. The first meeting? A happy hour with sponsored entertainment and food of course, but you have to be registered on the groupsite to get an invite!